THE ISS - NOW! WITH STARS !!! European sub-contractors to build Node 2.' ...FULLY CONSTRUCTED & COMPLETED... IN ITALY. ON EARTH. but the photos are not getting any more convincing. You wonder where the camera is situated? 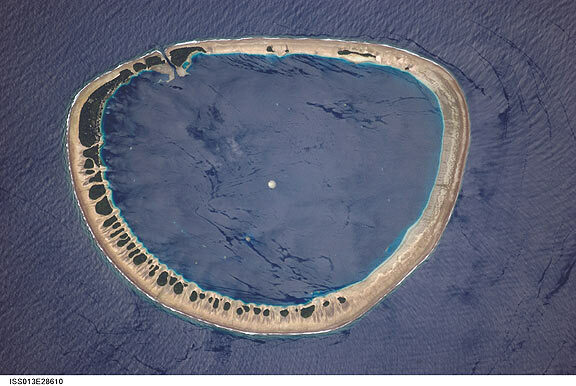 ISS013-E-28610 (31 May 2006) --- Nukuoro Atoll, Federated States of Micronesia is featured in this image photographed by an Expedition 13 crewmember on the International Space Station. Etc, etc. I would conclude all photos are faked! Is this to signify : "Yes, we spin" ? Indeed, Heiwa. This imagery could be created in any decent CAD package in less than 24 hours. 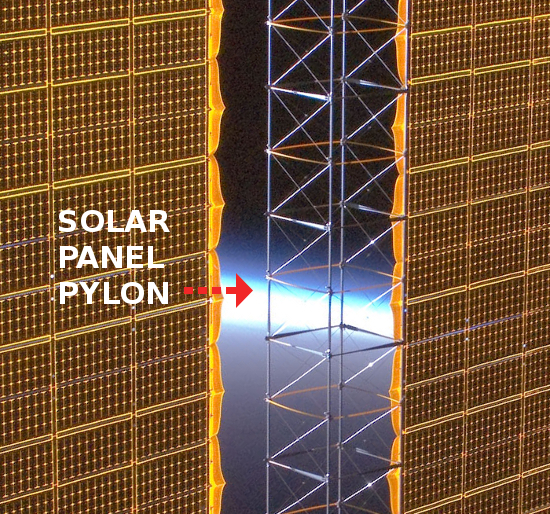 Please explain what light source can create the elongated shadows of the solar arrays compared to the shadow cast by the satellite dish on the last image? This imagery could be created in any decent CAD package in less than 24 hours. Sorry folks - I just had to open a new thread for the Hubble (and satellites) debate. There is still lots do here with the Space Shuttle and the ISS. To this day, this thread has been sort of hanging in a space vacuum. My concern is always to keep our discourse on track and free of digressions - however closely related they may be to the main topic. But to this, I would like to remind Nonho that photography is also a pretty old science by now - and it is, likewise, NOT an invention or prerogative of NASA. That is precisely why I (try to) limit my investigative efforts to observations and analyses I believe can be proved and demonstrated beyond reasonable doubt - with no fear of the entire planet's scientific community dismissing it offhand. The fact is, and we must all admit it with intellectual honesty, there are zillions of questions to which we have no answer for, when that 8-year-old nephew starts bugging us about outer space, gravity - and the universe in general. As we adults try to find out - we are met with a mass of conflicting science in this sphere of knowledge. To question it all (with due respect and attention to our forefathers' efforts) can only be a wise and rational thing to do. simonshack wrote: The fact is, and we must all admit it with intellectual honesty, there are zillions of questions to which we have no answer for, when that 8-year-old nephew starts bugging us about outer space, gravity - and the universe in general. As we adults try to find out - we are met with a mass of conflicting science in this sphere of knowledge. To question it all (with due respect and attention to our forefathers' efforts) can only be a wise and rational thing to do. Long answer, here, sorry! I do hope the reader will find the time to ingest it all because it contains elements for a discussion that goes beyond the scope of this thread, and involves our whole methodology in approaching these "scientific" subjects. Sounds like stopping the research? I disagree. Let's make another example, the Van Allen radiation belts. 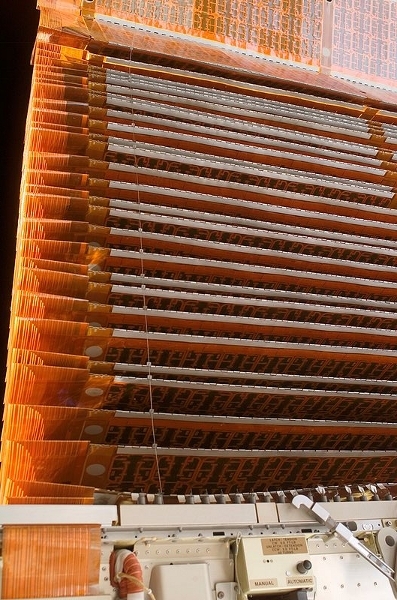 We all read how the belts are so filled with radiation no human could survive traveling across them, let alone survive in the harsh environment of space outside the magnetic fields of earth where radiation is even more intense or unpredictable. Very well. Now, while admitting the radiation power of the belts, NASA and most official sources deny, albeit feebly, the fact that they can be harmful for humans. They maintain the trip through the belts is so quick etc etc. Because of the collection of absurdities that Apollo is, we all tend to believe the first version of reality rather than the second, and I think this is understandable on our part and even logical. Yet in truth, it is unlikely any of us can understand or explain the matter in the proper scientific terms: it would take years and years of study --and access to the appropriate labs-- to get there. So, here's the point: would it be wise, would it be reasonable from our point of view to center the discussion about Apollo around the Van Allen belts, a scientific question that we are not qualified to understand thoroughly but only know from hearsay? Unable to master the scientific, medical and specific aspects, would we be on safe terrain? What if we quote the wrong sources? Shouldn't our inquiry rather start from the imagery of Apollo, the storyline, the words of the actornauts, in other words the sociological, visual, political, propagandistic aspects that we can understand and handle safely and pass on to others to judge? Same goes with, say, nuclear explosions. I would find it honestly absurd if here on this forum we pretended to be able to discuss the feasibility of nuclear explosions. If some of us could understand nuclear energy enough for this (something that admittedly requires years of study) it would still be pretty useless to share such knowledge on a forum where nobody else could follow the required formulas or schematics. It is much more reasonable and intelligent to discuss the propaganda aspects of the so called Atom Bomb, with all that it implies. Showing all the elements of deceit and misinformation is much more effective than laughing in the face of science, without being a part of that knowledge. I know it is frustrating that science is such a separated world that requires so much study to be approached properly. But I don't see much ways around it. Now you Simon called photography a science. Well, maybe so (and so is propaganda, certainly), but you must admit that it is not a science like rocket engineering or nuclear physics. It is a technology, with lots of human aspects to it, that most of us can handle and understand and experience directly. That's why it is, like you say, a much safer, logic, proper terrain for us. "The oldest statement of the law is that contradictory statements cannot both at the same time be true, e.g. the two propositions "A is B" and "A is not B" are mutually exclusive. This is the statement of the law given by Aristotle. It takes no account of the truth of either proposition; if one is true, the other is not; one of the two must be false." This law of Aristotle is helpful when performing photographic comparisons of one and the same object or scenery. Let me put this in simple words: if two photographers in the jungle snap synchronous pictures of the same blue parrot crashing into a tree, it would not only be unlikely - but totally impossible for one of the two photos - once developed - to show a grey monkey crashing into the same tree. That is, of course, unless the guy is a silly joker and enjoys playing around with Photoshop. Is photography a 'science'? Is logic a 'science'? I would certainly say so - and none of them are any more or any less 'established and academic' than, say, the science of astronomy or rocket science. 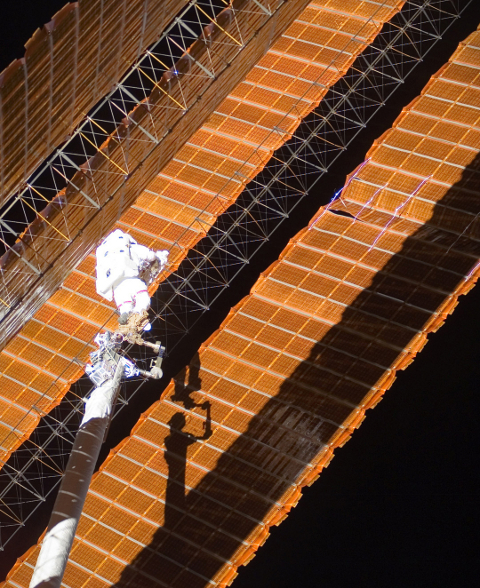 In order to stay on topic here, let me get back to that 'Damaged Solar Panel' incident of November 2008 at the ISS. As I go along, I will set forth how we may use basic notions of logic and photography - in tandem - to expose the phoniness of this umpteenth, astoundingly crude NASA propaganda tripe. photographed by an Expedition 17 crewmember on the International Space Station." I don't think I need to use arrows and circles to point out why this is not a photograph. The only fairly photo-realistic-looking part of this image is the very top, white/metal suspension structure. It is clearly lit from behind (correctly I guess, since the sun appears to be behind it - and below the Earth's horizon). 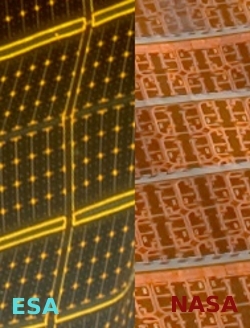 So what light source is illuminating all of the solar panels in such smooth and even way? If, after 40 years+ of Moonhoax imagery analyses, we cannot agree and establish beyond debate that this alleged authentic NASA image is wholly phony, I guess we can just pack our bags and hop onto Nasa's next shuttle to Mars - and see if we can find intelligent life up there. But I know: for anyone unfamiliar with photographic science (yes, that's what I henceforth will call it) the above may not constitute a satisfactory demonstration. So let's get on. One has to wonder - why didn't they just haul the damn thing down? As an ol' Norwegian sailor, that's what I would do if I had a hole in my sail. Now you will ask: "Why do they make such ravingly blatant blunders? Couldn't they do a better job of all this image fakery?" "How can so many people be kept quiet about this? Surely, there must be too many people involved?" Precisely. There are too many people involved. An organizational nightmare. I would imagine that between NASA, ESA and other secretive government agencies, the people involved number in the thousands. 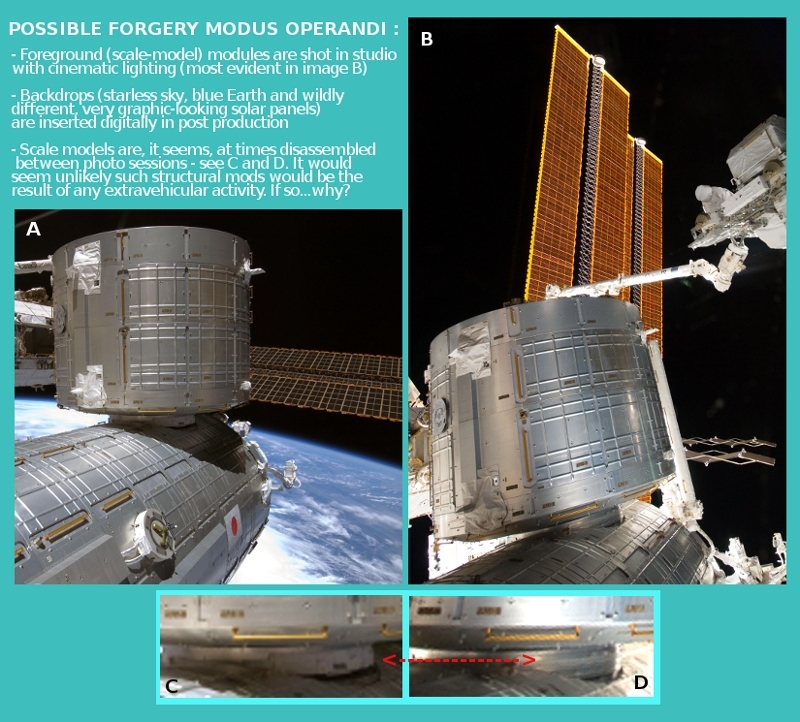 Among those, you'll probably have a few hundred graphic designers/photo retouchers/video editors/CGI animators in charge of the relentless manufacturing of fake imagery, given the amount of phony space photos needed to uphold the ongoing sham. And they would, most likely, have deadlines to meet whenever any given mainstream media-timed newsbite of their space adventures would be needed. Imagine the stress endured by the coordinators/supervisors of this constant, chain assembly of fake images - checking and comparing them all for consistency. Now, if you had such a golden, plum job (yes, NASA & co are rich) with a life/family to care for - and a gag order hanging over you, let me ask you: would YOU YOURSELF ever consider to speak out? No you wouldn't. It's called survival instinct - and it is the foremost priority observed by all human beings. And that's it for today folks. Need more incontestable proof of NASA's hocus-pocus skulduggery? Stay tuned. nonhocapito wrote: Same goes with, say, nuclear explosions. I would find it honestly absurd if here on this forum we pretended to be able to discuss the feasibility of nuclear explosions. If some of us could understand nuclear energy enough for this (something that admittedly requires years of study) it would still be pretty useless to share such knowledge on a forum where nobody else could follow the required formulas or schematics. It is much more reasonable and intelligent to discuss the propaganda aspects of the so called Atom Bomb, with all that it implies. Showing all the elements of deceit and misinformation is much more effective than laughing in the face of science, without being a part of that knowledge. To approach science "properly" requires trust and communication that hasn't been earned by NASA. Let's take two friends who want to be scientific about something. I have to trust that my friend is talking about the same thing that I am talking about if I am going to make agreements about what has been observed. Science besides this is more of a belief system and less about strict observations with mutual communication. Our site is idealistic with science - we ask for more authentic communication than the average scientist. Sometimes we do so in a harsh way, but often I think people recognize that we do this to help create a more honest and less hostile environment for our species to co-exist with itself and others. We want a little better proof of intention. Since 15-year-olds can read and trust Brian Greene's Elegant Universe, which is packed with metaphors that explain some of the most abstracted calculations of how our universe might be physically constructed, the years-upon-years-of-study you say might be real science ignores my idea that it takes an instant to understand extremely complex things once trust exists. Understanding is different than trust, which is the missing element here. The reason science takes years isn't because of exclusive information. It's because that's how long trust takes. Trust applies to people who treat one another with careful - sometimes difficult-to-observe - agreements. The college student who thinks he understands everything because five professors have endorsed a particular belief that he can repeat doesn't actually compare to the drop-out who has observed and recorded for herself some kind of revelation that proves to be true for other people again and again by her own careful observation over years. The former is a follower and the latter is the true scientist. The apparent fact that people have to pass down the knowledge that "the world is round" in some way - in every culture - over and over at the risk of people forgetting it shows us that our knowledge will always be limited to direct human experience. We haven't "evolved" into the belief that the world is round. It is something we must teach each other. Rocket science and nuclear science are consequences of a hundred years of mutual trust and communication. Without trust and communication, we must step back to observable repeatable patterns. We will not boldly march into a faith-based science that assumes the human has other humans' knowledge in mind - not when we are treated by those people as jerks. Scientists are so out of whack today. They are brainwashed to believe that whichever scientist shouts the loudest deserves the most trust. It's wrong. It doesn't build trust - it only hooks people into a drama that they don't calculate for themselves. We demand better science and this begins with authentic communication of so-called nuclear science, rocket science, etc. You and Simon and everyone here are a part of that. If we are not prepared to hold our stories accountable to reality, then do we deserve a place in it? Last edited by hoi.polloi on Sat Apr 07, 2012 5:58 pm, edited 4 times in total. WOW! Looks like this thread is moving fast as a comet ! It could be scarier than cosmic debris! The debris just missed the ISS - by 820 feet - that's 250 metres...Phew ! "The space junk was detected too late for a ducking manoeuvre," the source told Interfax." Whew -- I guess the 1's and 0's passed safely through the Internet without damaging the sensitive data that makes us believe in the ISS. hoi.polloi wrote: Scientists are so out of whack today. They are brainwashed to believe that whichever scientist shouts the loudest deserves the most trust. It's wrong. It doesn't build trust - it only hooks people into a drama that they don't calculate for themselves. You are perfectly right, Hoi, vulgarization of science is based on trust. This exactly fits with my previous points in this sense: because on this forum we have a healthy suspension of trust; because we don't just believe what a "Brian Green" tells us (very good example there); because ideally we want to be able to verify every tale that is spread in support of something we recognize as faked: for all this, when it comes to scientific details, we have no option but either to master them (skipping the man in between, the promulgator of the divulge version) or we have to leave them aside. To leave them aside means not to censor them, but that they should not become a main argument in our discussion: "Artificial satellites are scientifically impossible!" Such statement requires a lot of calculations and a public to understand such calculations. Suppose we wanted to prove that the theory of relativity or the string theory are false. Sure, we can decide that Brian Green's metaphors, or Einstein's, are bogus. But the answer of the physicists invariably would be: there are mathematical formulas that prove these points. If you cannot understand the formulas, how can you object to the theory? Well all I'm saying is that there is a truth to that: a truth that should not stop us from trying, but should caution us not to take lightly questions that go deep into some knowledge that it took us centuries to build up and that it takes a long time to study and comprehend. Despite my distrust with Academy and with Official Truths, I still respect the hard work and study that is required for the accomplishment of all the complex things that we see around us. simonshack wrote: This law of Aristotle is helpful when performing photographic comparisons of one and the same object or scenery. Let me put this in simple words: if two photographers in the jungle snap synchronous pictures of the same blue parrot crashing into a tree, it would not only be unlikely - but totally impossible for one of the two photos - once developed - to show a grey monkey crashing into the same tree. That is, of course, unless the guy is a silly joker and enjoys playing around with Photoshop. Dear Simon, you are completely right. Photography is a science and one that I certainly am way less qualified to understand than you are. 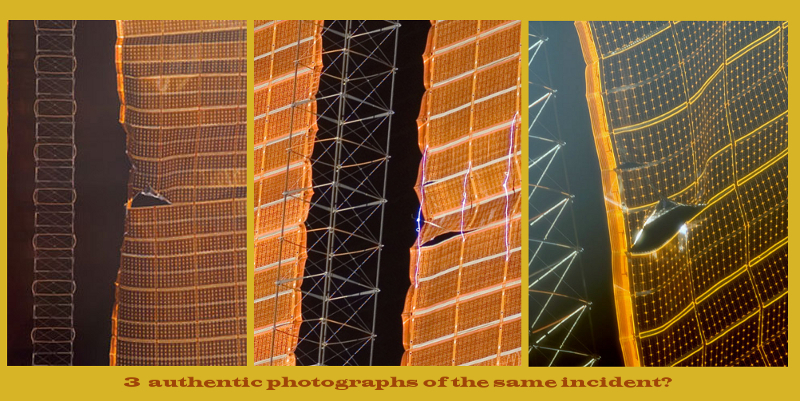 In fact, often times when you point out that some imagery is certainly fake and cannot scientifically be called "photography", I suspend my judgment because I don't see right away what you mean. I can follow you to a point, after which I need to see or take in more elements. In this sense, aside of the occasional moment of glory (lol), I am certainly a "rearguard" in the research, one whose job at the end of the line could be to make sure that all the elements are still there to make sense as we progress. I guess my caution, not directed at you or anyone in particular, was to prevent us to apply the same confidence that we have in a certain field (say our understanding of photoshop or of video editing) to any other field we happen to face. It is the easiest thing, when not knowing a science, to miss some key element that keeps the whole castle in place (even, of course, if the whole castle is fake! The hubble is probably fake, nonetheless it is possible that a large part of the science that work as a premise to it is real). (Personal account: I studied art history for a few years, and always had a knack for identifying painters, especially of the Venetian Renaissance, from certain details or techniques; Over the years I also got to understand, god knows how painfully, how disastrous are the restorations that such old paintings are suffering these days, and how the essential elements of the art of those ancient masters is being destroyed by said restorations, to the point of nullifying my ability to understand the paintings and the masters. Long story short, few things annoy me more that hearing the eternal phrase, entirely based on trust and not on knowledge, "restorers know what they are doing! It is a science!" ~ end of personal account). As to the ISS. Yes I am convinced at this point that the ISS is a digital creation. As cool as I can play it, a part of me is in fact still flabbergasted and confused by this, because there are numerous elements that I still need to fit in with this idea. It is exciting on one hand, but also almost oppressive to visualize. As to the "too many people involved" argument, this is very interesting. However, it could also be the opposite: it could be that the fakery teams are a very restricted circle, with lots of work to do, and this is why they make the mistakes. Thinking about Apollo, it seems that one of the elements of the project had to be the compartmentalization, that would give the illusion to large parts of the scientists to be working on real projects. Of course, at the core of any project would be a hollow structure based on fakery with a few criminals holding the threads. But all around there could be a mass of people actually conned to do certain parts of the jobs. Maybe parts that eventually produced patents and thus made money on the way. Naturally, many individuals in these compartments would "sense" the fakery above them, but would also, like you say, never talk openly about it, also because they could never be entirely sure of its proportions or nature. To leave them aside means not to censor them, but that they should not become a main argument in our discussion: "Artificial satellites are scientifically impossible!" I agree. Starting from such a basis is ridiculous. It's as bad as assuming they are possible without testing. We should just assume we don't know and investigate from there. I am also willing to place a lot of faith in the work that has been done in science in the past few centuries. And yes, I did have that impression, nonho - they released the article as a response to us. Or it's a hilarious coincidence. But all around there could be a mass of people actually conned to do certain parts of the jobs. Maybe parts that eventually produced patents and thus made money on the way. Naturally, many individuals in these compartments would "sense" the fakery above them, but would also, like you say, never talk openly about it, also because they could never be entirely sure of its proportions or nature. As long as we are speculating, we must assume they share a common culture that would allow them to be lied to. The biggest fools are the ones trying to fool us and who actually believe what they are saying. An example of where we find evidence for this kind of culture is in the video of the interview with the "button pusher" of the shuttle launches. The narrator jokes that everyone in the studio is forced to look away from the actual launch and stare at their screen - even the guy who is pushing the button. This kind of blind trust they are expected to exercise doesn't mean nobody actually takes a peek behind them - or that nobody in the room is out of the loop that the program is somewhat of a hoax - but it demonstrates the expectations of behavior: blind trust. Who knows what actually takes place. Perhaps something launches from there. Perhaps nothing. Perhaps the room itself is a joke. However, the culture of expected blind trust gives the public a feeling of wonder and appreciation for how something miraculous as a manned space shuttle can exist as a collaborative adventure without foul play involved. It's quite psychological actually, and it would make sense given that the government-army is wont to use "Psychological Operations" on the public. 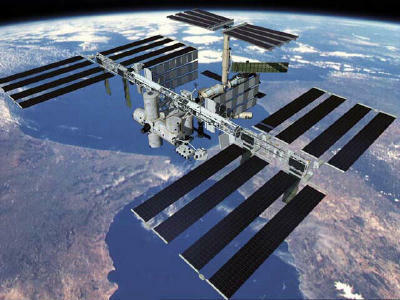 Quote "A piece of debris has narrowly missed the International Space Station (ISS), forcing its six crew members to go to their escape capsules and prepare for an emergency evacuation back to Earth. The junk was of unknown size but experts say even a small object could do considerable damage to the ISS. The US space agency's (Nasa) Associate Administrator for Space Operations, Bill Gerstenmaier, said it was the closest a debris object had ever come to the station. An analysis was now under way to try to understand its origin, he added. THe 'debris' came within 1100 feet of the 'space'ship no less! Jees you go offline for 2 days the sky(labs) falls in! p.s. maybe the origin of the 'debris' came from someones imagination? Is that possible?